How long has it been since I did a proper review of a book? A long time, ‘cos I’m pretty much retired from that game, but sometimes nice publishers send me cool books to read and I’m drawn to them like a moth to a flame. HALF A KING was one of those. 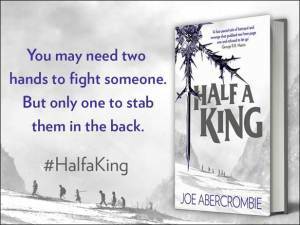 This is the first Joe Abercrombie book I’ve read — I’m not much of a grimdark fantasy reader, and well, he’s Lord Grimdark himself. Honestly I’m not much of an epic fantasy reader at all… or I wasn’t. But last week I finished The Lies of Locke Lamora, which has re-ignited my taste for a good epic fantasy, and Half a King felt like a good way to keep that flame burning. And it is. It’s a nice mix of Game of Thrones and your more traditional quest narrative, with a chilly snowsept cover that well represents some of the novel’s most chilling scenes (look, I couldn’t resist that pun). With Christmas just around the corner, it’s the perfect time of year to be reading about adventurers struggling through snowy tundras. 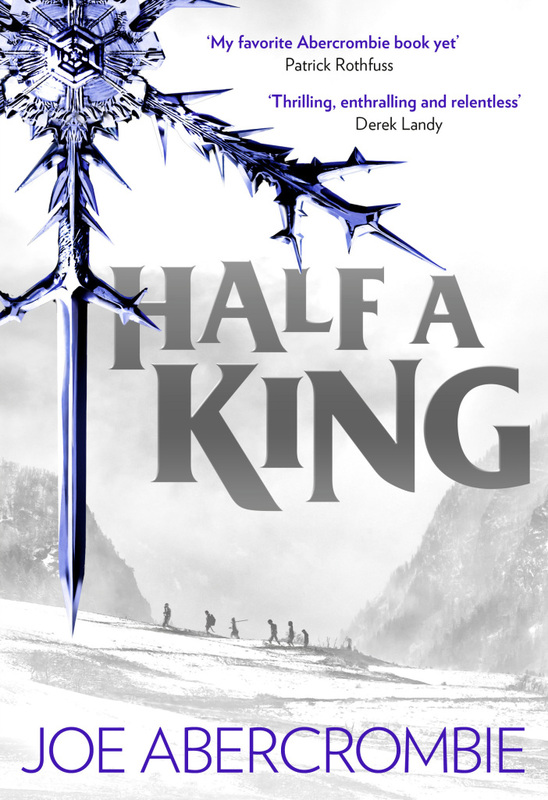 In a lot of ways, Half a King follows a familiar path; a revenge quest, a band of ragtag adventurers, loyalty and friendship and fighting. But it also brings in a lot of fresher elements: a bitter, sarcastic disabled protagonist who’s not a strong fighter, women in powerful roles and with detailed, flaws characters, and a detailed pantheon of gods that’s quite different from the norm. This is a YA (teen) fantasy, rather than Abercrombie’s standard adult fantasy, but he moves into the style well and it’s a well-written and easy read. I would have preferred more world-building detail, but apart from that the only other problem that caught my attention was the timeline: the chapters are fast-paced, but there’s a lot of skipped weeks and months that are clearly signposted, and by the end of the story it felt like a lot more time had passed than “months” as mentioned towards the end. All in all, this is a very strong fantasy novel that’s easy-to-read and enjoyable, though perhaps a bit truer to tropes than the hype led me to believe. It’s a really fun read, and a great starting point for epic fantasy fans interested in exploring YA fiction. Thanks to Harper Voyager for providing me with a review copy of this novel in exchange for an honest review. Then he meets Diana, who makes him wonder what he even knows about love, and Teeth, who makes him question what he knows about anything. Rudy can’t remember the last time he felt so connected to someone, but being friends with Teeth is more than a little bit complicated. He soon learns that Teeth has terrible secrets. Violent secrets. 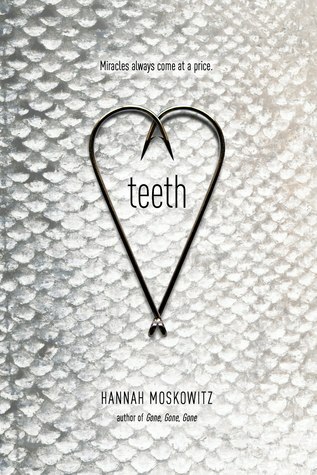 Secrets that will force Rudy to choose between his own happiness and his brother’s life..
I’ve never read Hannah Moskowitz’s work before, though I’d heard great things about her contemporary writing. 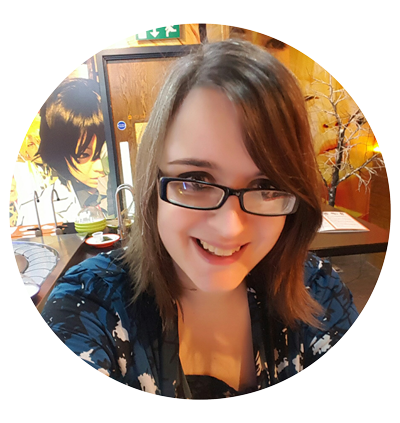 She’s also a regular contributor to the AbsoluteWrite forum’s YA sections (and an advocate of never holding back when it comes to language or content in YA — her post on ‘edgy YA’ is well worth a read). So when I heard she had a fantasy novel coming out nicknamed the “magic gay fish” story, I added it straight onto my preorder list. I wanted to try out her work, and that nickname sounded like it would be strange, shameless and right up my street. Hannah’s style is easy to read, dialogue-heavy and snappily paced. The dialogue feels very honest, which means very profane, and while some readers may find that off-putting I enjoy it. It makes for the most realistic teenage male narrator I’ve read in YA fiction. There’s only a small cast of main characters in this story, and they’re all flawed and dysfunctional in one way or another. Rudy is a lonely boy, worrying about his future and his little brother, and Teeth is an ugly, angry fishboy who learned most of his words from the local fishermen and can barely construct a sentence without a f-bomb in it. The secondary characters are less fleshed-out, which is a shame as I’d like to know more about some of the parents struggling on the island. Trigger warning: There’s also some very frank, bleak scenes of repetitive sexual abuse. This whole book is dark to the extreme, and though the abuse is portrayed extremely negatively I think it would be just too difficult and depressing for some readers. The ending really caught me off-guard. The twist that led to it was brilliant, completely shocking me, but the actual closing chapter left me feeling disappointed. I wanted more of a sense of closure, and instead I got quite an abrupt cut-off. I think the ending is supposed to tie into the underlying metaphors and hidden meanings in the story, but I wasn’t reading this book for the metaphors about the environment or government — they were nice elements, but not what drove me to pick this book up. Also (and I fully acknowledge that this is an issue with my personal tastes and expectations as a reader, not the writer’s fault) I really wanted things to turn out differently. Despite my dissatisfaction with the ending, I really loved Moskowitz’s style and her way with describing characters. I hope to check out her contemporary YA very soon. This book was a personal purchase. I have no connection to the writer or publishers involved. Pantomime Release and Dissident TV Pilot! Man, today was a crazy day for my writing friends. It was the US release of Pantomime by the lovely Laura Lam! 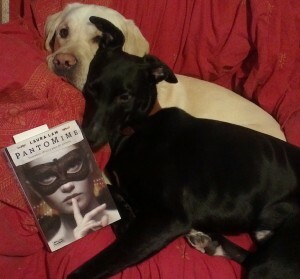 The official UK release is tomorrow (February 7th), but Amazon have been shipping out orders early which means I’ve been snuggling up to read it every night… when the dogs don’t steal my armchair to have a read, that is. And that’s not the only awesome news happening on our writing front! My friend John Dixon’s YA Thriller, Dissident PHOENIX ISLAND, comes out in 2014 and he’s sold the pilot of Intelligence, a show based on it, to CBS! John’s been working hard to get this far, and it’s great to see it pay off for him. Go stop by his blog and say congratulations, because when Dissident hits the shelves it’s gonna be huge. Man, it’s great to see good things happening to my writing friends. :) But now, it’s time for me to settle down with a cuppa tea and read more of Pantomime. 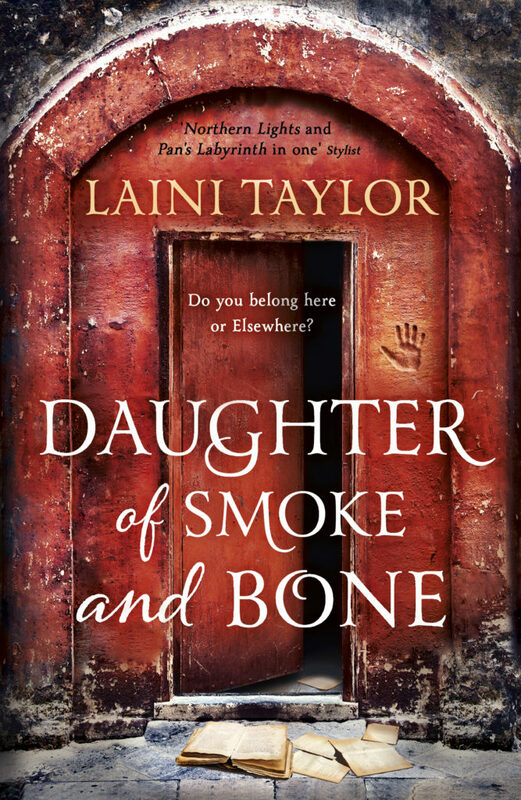 On 16th August Hodder Books will publish the paperback edition of Laini Taylor’s brilliant YA fantasy novel “Daughter of Smoke and Bone”. The book itself is wonderful, and you can find my review and the hard back cover over here. 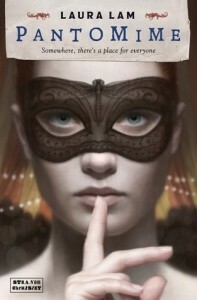 I have a bias towards the original cover, because it’s the cover I own and love — and I adore designs that use feathers. but there’s plenty of interesting aspects in this new cover. It seems to be aiming at an older audience (crossover? ), reminding me a lot of some women’s fiction covers while still keeping the story elements obvious, and I like that the font is almost identical to the original. Ryan Graudin’s LUMINANCE HOUR, in which a partying prince falls for a Kate Middletonesque fae, who has been protecting the royal family for centuries, and who must make an impossible choice amidst a backdrop of a palace murder and paparazzi mayhem, to Alyson Day at Harper Teen, in a very-nice deal, in a two-book deal, by Alyssa Eisner Henkin at Trident Media Group. I’ve done some beta reading work for Ryan, and was stunned by the professionalism of her work. It’s fantastic to see her writing recognized with a two-book book deal to a major publisher. I don’t think there’s any information about a UK release yet, but with those brilliantly topical monarchy themes I can imagine it doing brilliantly here. 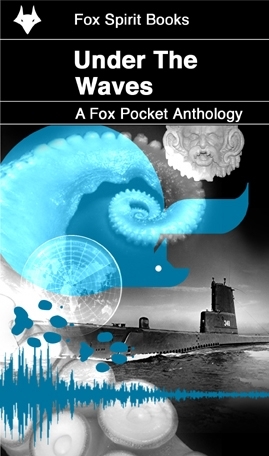 I can’t wait to pre-order and read “Luminance Hour”. Ryan discusses the announcement here, with a fun video discussing the wait and how she coped here.